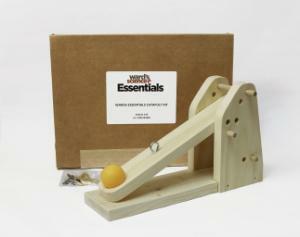 Play with the physics of a catapult to learn about levers, force, acceleration and much more! Explore force, acceleration, Hooke's law, and parabolic trajectories by building and testing a fully-functional catapult. Contains catapult base, sides, lever arm, rubber bands, screws, dowels, hook, and ping-pong ball.